Find a job you love and you’ll never work another day in your life. That’s why we’re so committed to helping you find it! 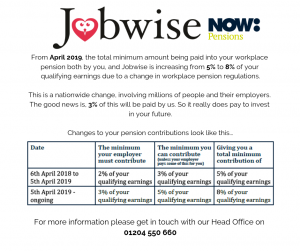 At Jobwise we understand that looking for a new job can be stressful and time consuming. That’s why we aim to make your recruitment experience as straight forward and pain free as possible. We pride ourselves on personal service, that’s why we spend lots of time on a one to one basis getting to know you before we even start to look for suitable roles. We’ll work hard on your behalf contacting suitable employers and we’ll even proactively contact employers that you have shown interest in working for. And best of all – our services are completely FREE.